Inexpensive all-rounder. 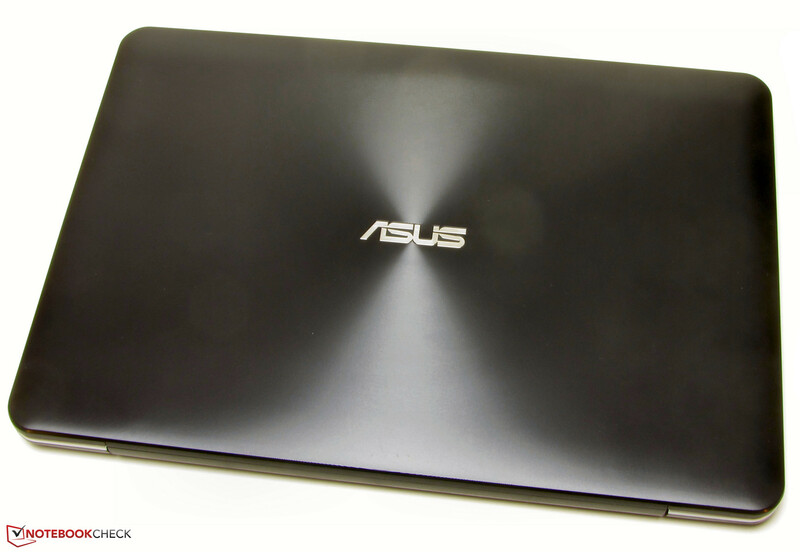 A Core i3 processor and GeForce 820M graphics core make the Asus laptop a versatile all-rounder that offers enough power for everyday use and playing the odd game. Could buying a device for around 450 Euros (~$505) be a mistake? 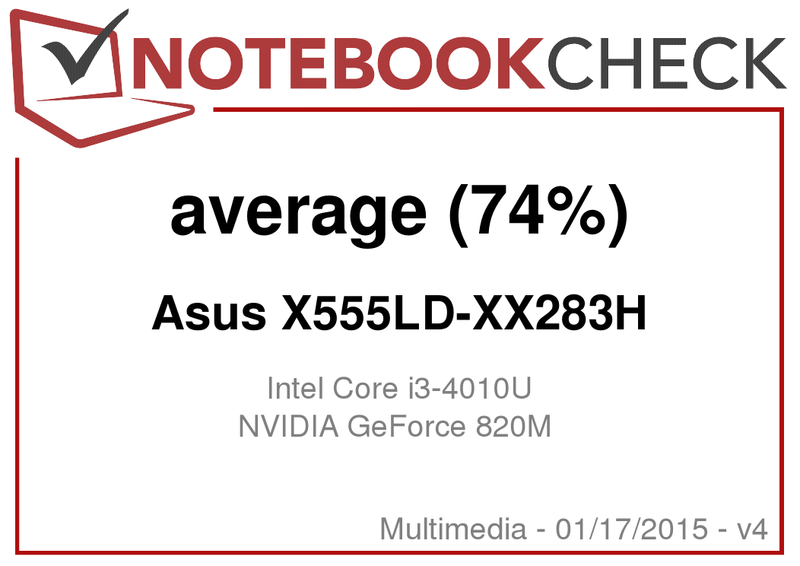 Asus' X555LD-XX283H is no stranger to us since we have already tested two models from Asus' latest X555/F555 series. Only recently, the identically built F555LD-XX243H sister model was on our test bench. The latter has a higher memory capacity, a larger hard drive, and features a white casing. We have also tested a more powerful model: The X555LN-XO112H is equipped with a Core i5-4210U processor and GeForce 840M graphics core. The X555LD finds rivals among the inexpensive all-rounders of other manufacturers. For example, we mention HP's 355 G2 and Lenovo's IdeaPad Z50-75. The casing of theX555LD cannot boast of metal parts. It is entirely made of plastic. The base unit's upper side is silver-gray. Furthermore, it is textured. The palm rest features a fine grooved texture, and the rest of the upper side features a subtle grid texture. All other parts of the casing are black. 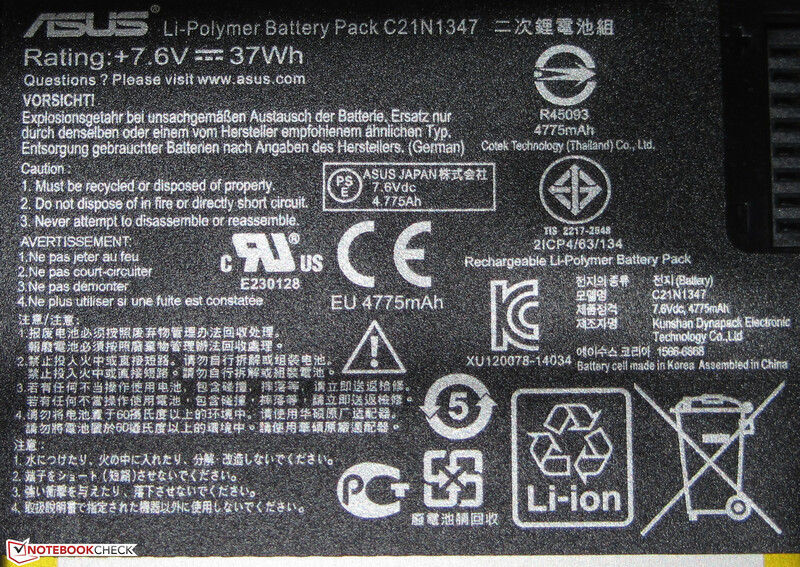 Texture is also found on the back of the display. Grooves ripple out in a circle from the center. The laptop does not have a large maintenance cover. Only a small flap that hides an empty memory bank is on the laptop's underside. 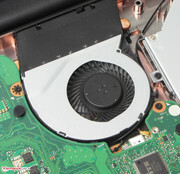 The casing would have to be opened for replacing components such as the hard drive. The casing's sturdiness and build correspond to the price range. 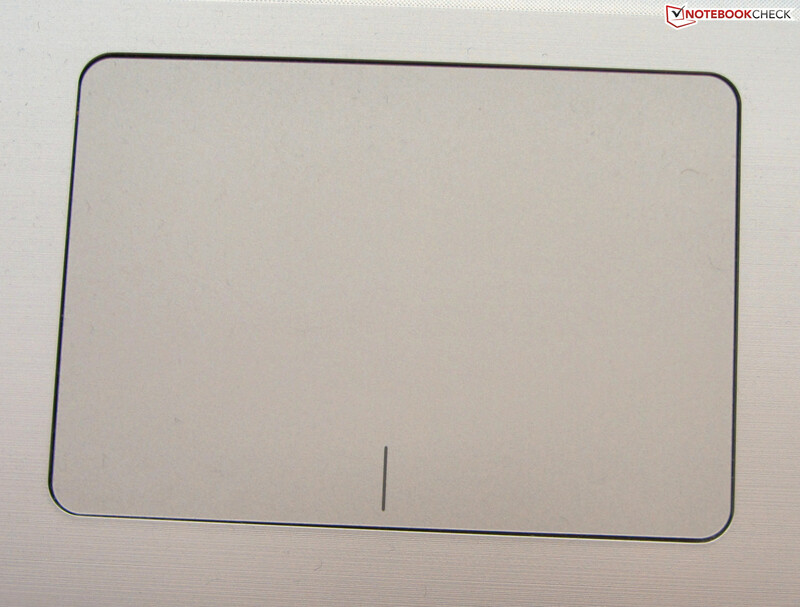 Applying pressure to the left of the keyboard causes the casing to yield marginally. 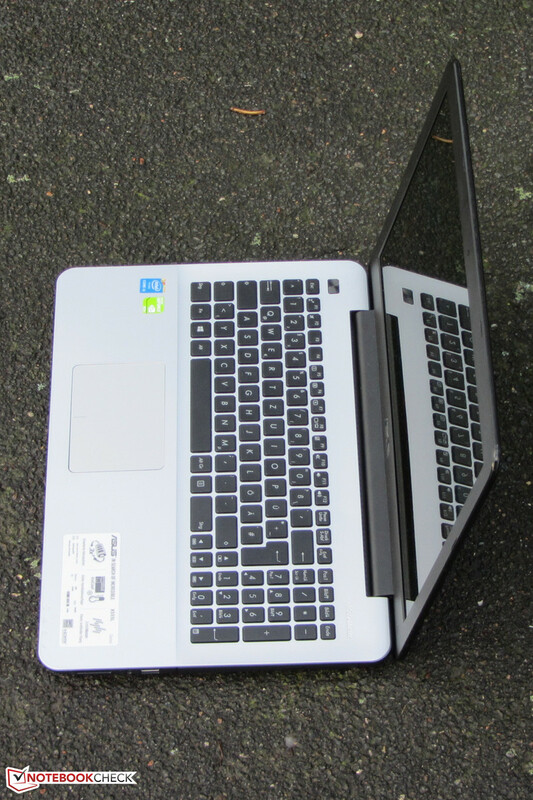 At the same time, the laptop's front right stopper lifts from the surface. The base unit's stability is still satisfactory. The lid could be slightly more rigid - but this is true for the lids of most laptops from the other manufacturers. The hinges keep the lid firmly in place, but rock slightly. Opening the lid with one hand is possible, though with a little wiggling of the lid. A small flap enables accessing the memory bank. The X555LD does not provide any unexpected or even unusual interfaces. 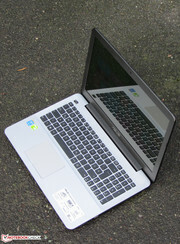 The connectivity is identical to that of its rivals like HP's 355 G2 or Lenovo's IdeaPad Z50-75. Ports are installed in the back left area of the X555LD, therefore, cables will not interfere with the palm rest. 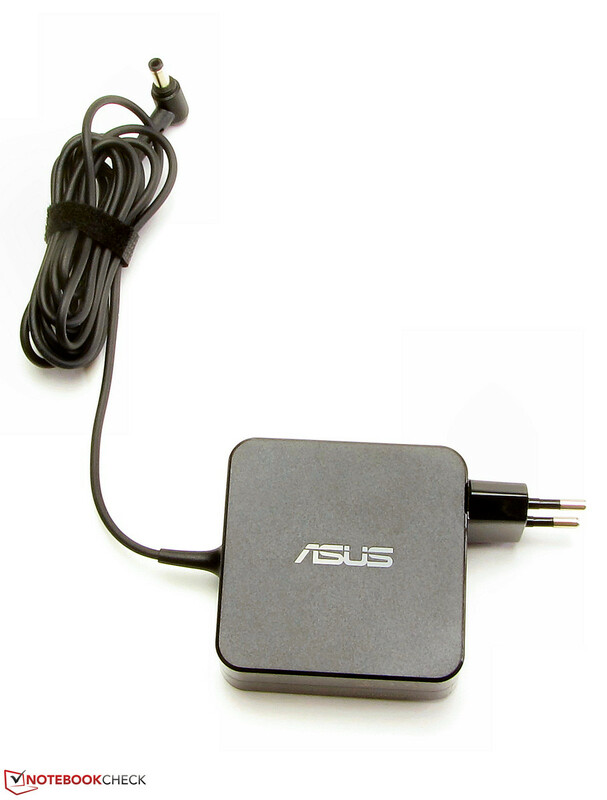 Asus has equipped our review sample with an AR9485 Wi-Fi module from Atheros that supports the 802.11 b/g/n standards. We did not have any reception problems. Neither the connection, nor the transmission rates broke down within a radius of approximately 15 meters (~49 ft) around the router. The Gigabit Ethernet chip in Asus' laptop comes from Realtek (RTL8168/8111 Family). The laptop is not equipped with a Bluetooth module. The webcam takes muddy pictures with resolutions of up to 1280x720 pixels. The laptop does not come with any accessories apart from a slim manual and warranty information. Windows 8.1 (64-bit) is the preloaded operating system. The X555LD comes without a recovery DVD. 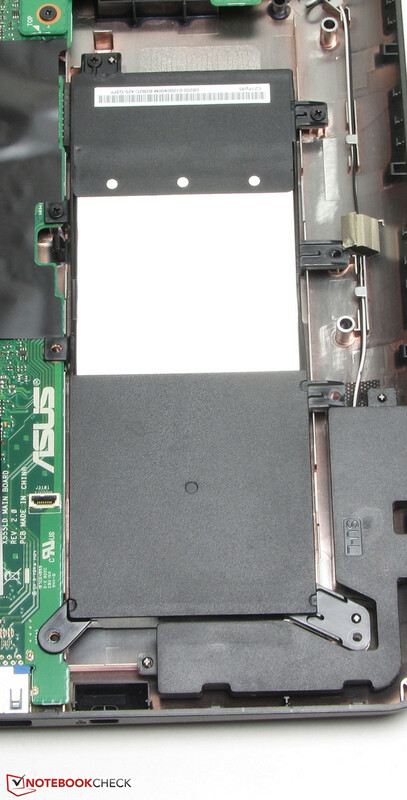 A small hatch for accessing the working memory bank is found on the laptop's underside. 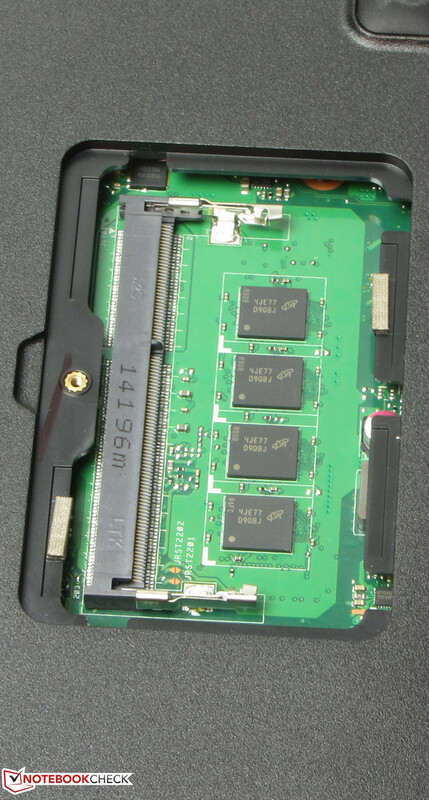 The base unit's upper side would have to be disassembled for accessing the other hardware components. This is not difficult. 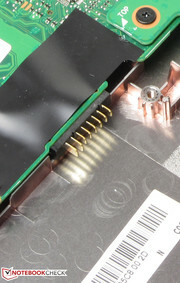 The base unit's upper side can be lifted off with a putty knife after removing all screws from the device's underside. Note: The upper side is connected to the motherboard with two ribbon cables. 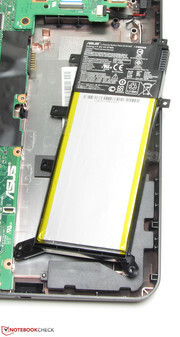 The hard drive, fan and battery can be accessed after opening the casing. A two-year warranty is included with the X555LD. 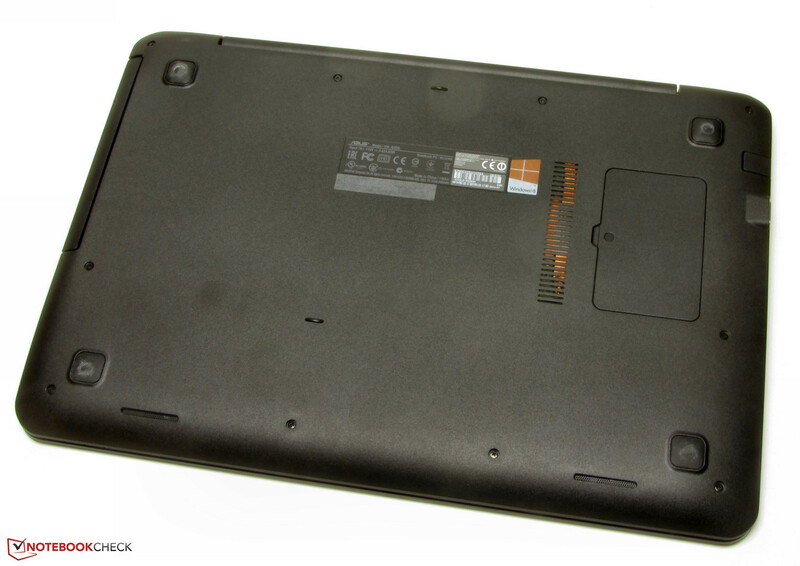 This is also the case for Lenovo's IdeaPad Z50-75. Customers of HP's 355 G2 have to be satisfied with a one-year warranty. 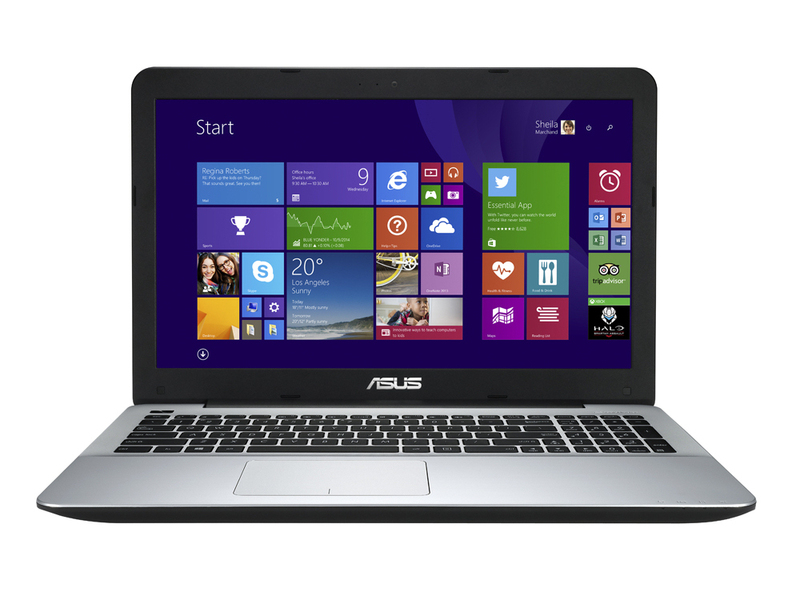 The warranty on Asus's laptop can be upgraded to three years for approximately 80 Euros (~$90). The chiclet keyboard in the X555LD is not illuminated. The even, lightly roughened keys have a medium drop and clear pressure point. However, the keyboard yields visibly when typing on it. Most users will not have any problems with this, but prolific writers will find it useless. 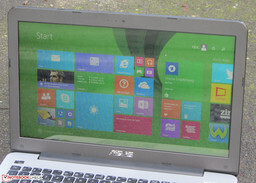 A multi-touch ClickPad (a touchpad without dedicated mouse keys) is installed in the laptop. It has a surface area of approx. 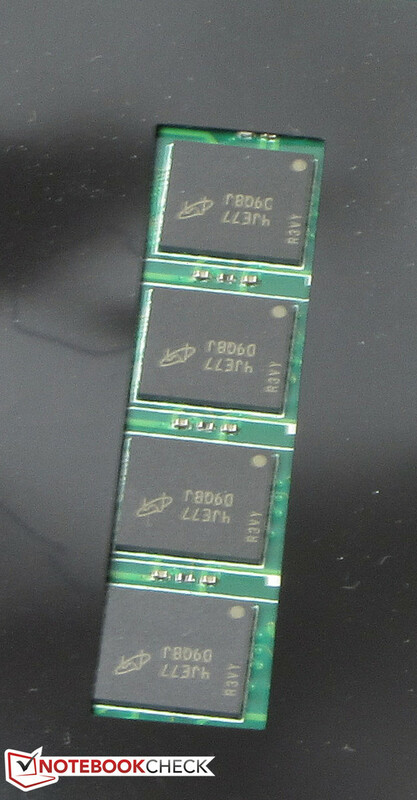 10.5 x 7.3 cm (~4.1 x 2.9 in). The sleek surface does not prevent the fingers from gliding. Furthermore, owing to the generous space, gestures are easily implemented. The pad features a short drop and a clearly audible and palpable pressure point. 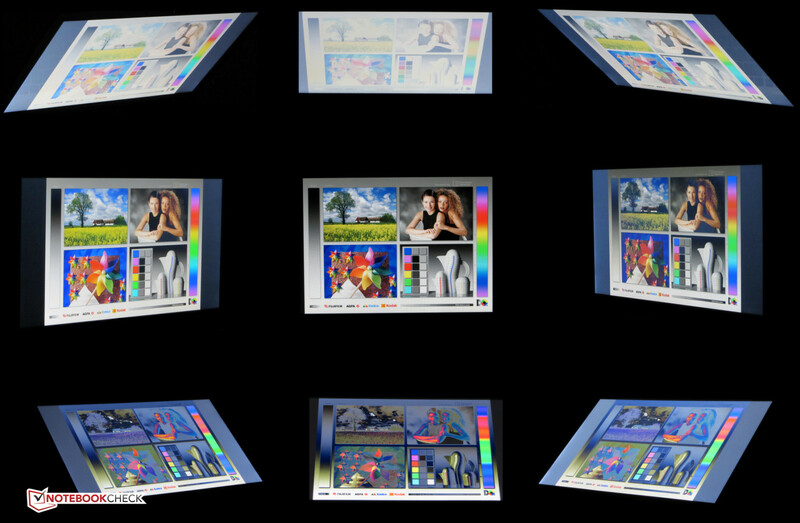 The glossy, 15.6-inch screen in the X555LD has a native resolution of 1366x768 pixels. The installed model only provides a very low brightness of 167.4 cd/m². It is beyond comprehension how Asus came up with the idea of installing such a dark screen. The screens in HP's 355 G2 (213.2 cd/m²) and Lenovo's IdeaPad Z50-75 (223.9 cd/m²) achieve better rates - though their rates cannot be called good, either. On the other hand, the screen's contrast (553:1) and black level (0.34 cd/m²) are good. 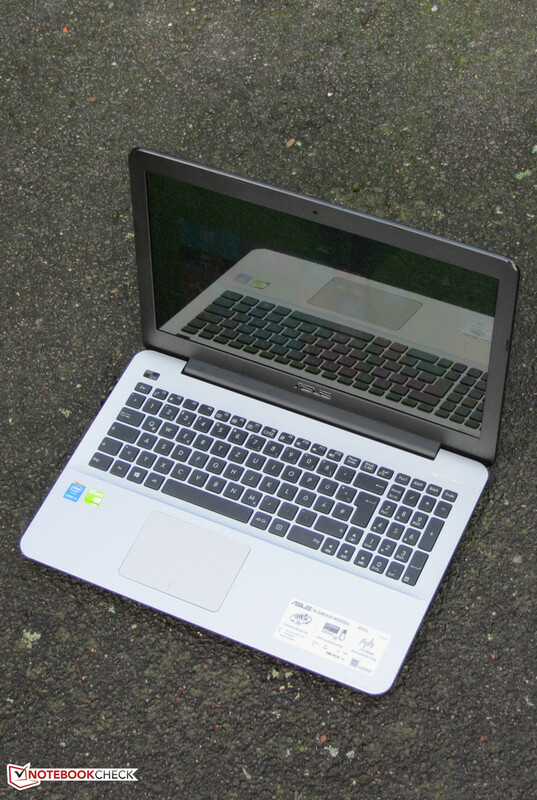 The screen is on par with the one in the IdeaPad Z50-75 (536:1; 0.42 cd/m²). 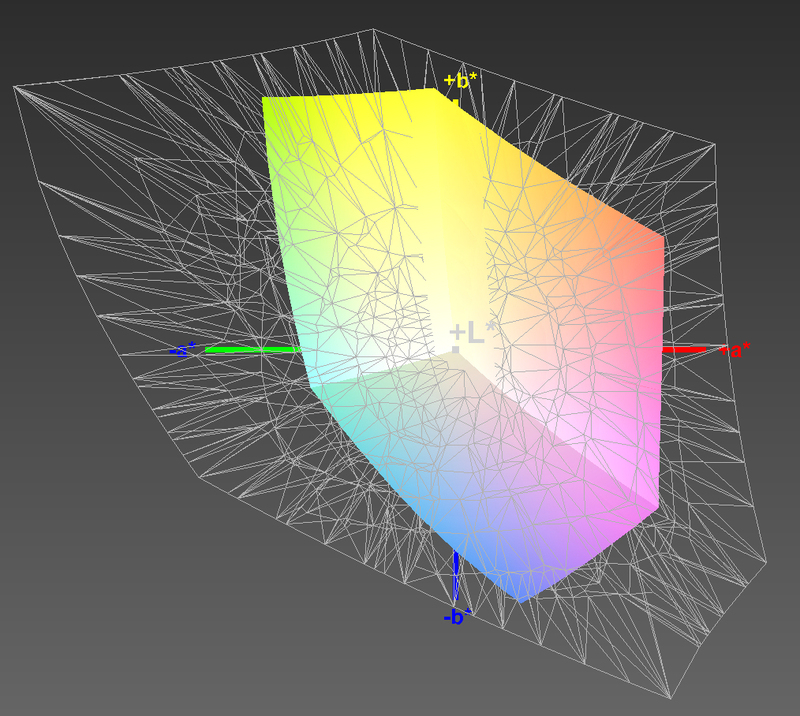 The screen in HP's 355 G2 (174:1; 1.21 cd/m²) delivers very poor rates. The X555LD's screen cannot reproduce either the AdobeRGB or sRGB color spaces. The coverage rates are 61.7% (sRGB) and 43.7% (AdobeRGB). 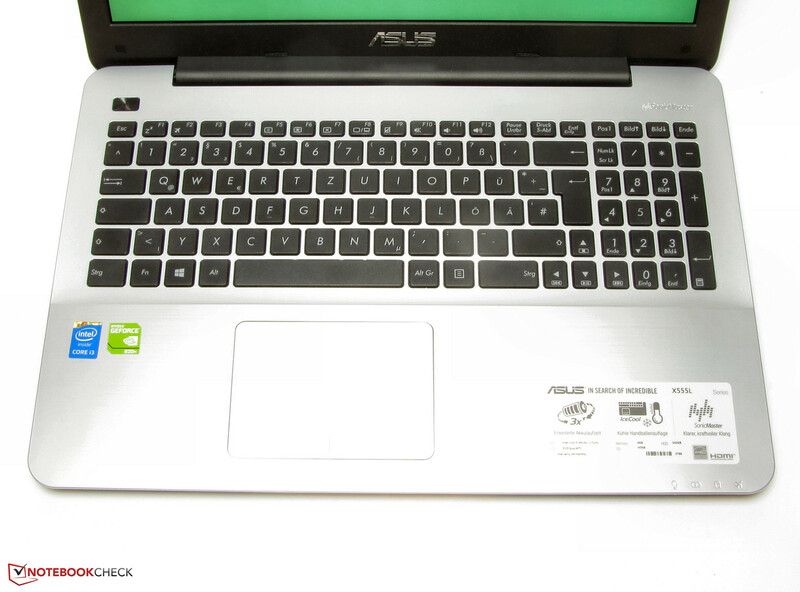 Laptops from Asus normally come with a color profile ex-factory, i.e. 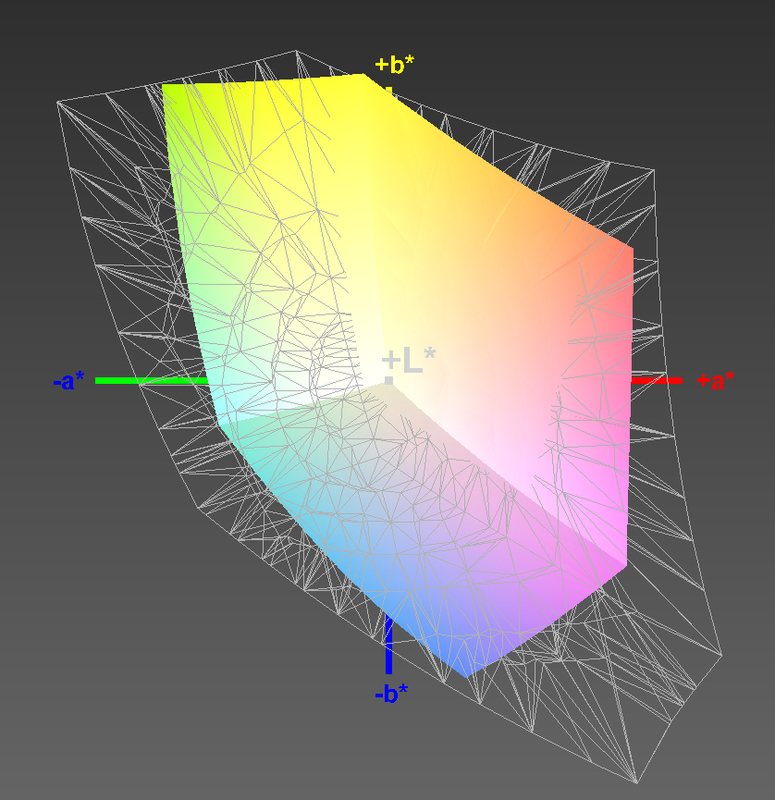 the default color reproduction is better than most models from the competition. The X555LD also comes with a color profile. The profile of our review sample seemed to be faulty or was not installed properly. The rates we measured were absolutely unrealistic. Therefore, we calibrated the screen. Our experience shows that the rates obtained after calibration should largely be identical with the rates that the screen should provide when the Asus color profile has been installed properly. The screen presented an average DeltaE 2000 shift of 5.4 after calibration. A rate less than 3 would be desirable. The screen does not have a bluish cast. The X555LD is equipped with a TN screen. This screen type can only serve with limited viewing angles. The horizontal angle is quite generous, and several people can look at the screen simultaneously. Changing the vertical viewing angle quickly leads to image distortions. 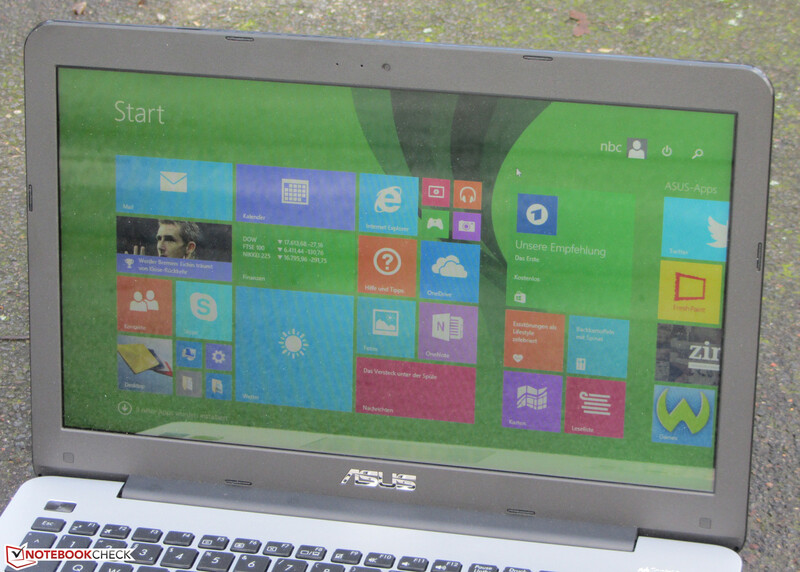 It is not really possible to use the laptop outdoors due to its low brightness and the glossy surface. 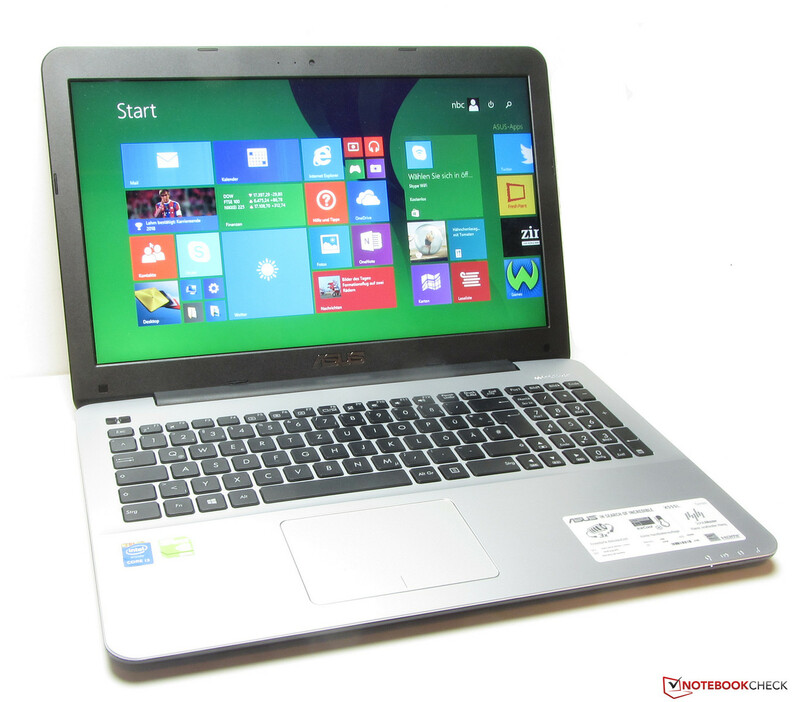 Asus' X555LD-XX283H is a member of the inexpensive all-rounder devices in a 15.6-inch size. The computing power of the Core i3 processor is enough to cope with everyday tasks, and the GeForce core allows gaming, at least to a certain degree. Our review sample is available for approximately 500 Euros (~$561). Asus has countless other configurations within its X555/F555 product line. The X555LD is powered by Intel's Core i3-4010U dual-core processor (Haswell). It operates with a base speed of 1.7 GHz, and does not have a Turbo. The processor supports Hyperthreading (two threads per core can be processed). Intel specifies its TDP of 15 Watts. The processor performed the CPU tests of the Cinebench benchmarks with 1.7 GHz in both AC and battery mode. AMD's A8-6410 in HP's 355 G2 is a relatively equally matched rival. Intel's CPU and AMD's APU are roughly on par in the multi-thread performance, whereas Intel's processor has the lead in single-core performance. The system ran smoothly and we did not experience any problems. Increasing the system's overall performance would be possible by installing a second working memory and solid state drive in the laptop. The PCMark scores of the X555LD are good. However, the device achieved marginally worse rates than the F555LD-XX243H model configured with the same CPU - GPU combination. The reason for this is found quickly: The working memory of the F555LD operates in dual-channel mode and also features a slightly faster hard drive. 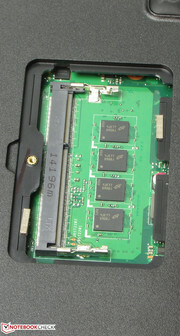 Therefore, we installed a second working memory module in the X555LD (i.e. the dual-channel mode is enabled), and repeated the PCMark 8 benchmarks. The difference with the F555LD was much smaller then. The storage device in the X555LD is a hard drive from Hitachi's Travelstar Z5K500 line. It has a capacity of 500 GB, and spins with 5400 revolutions per minute. 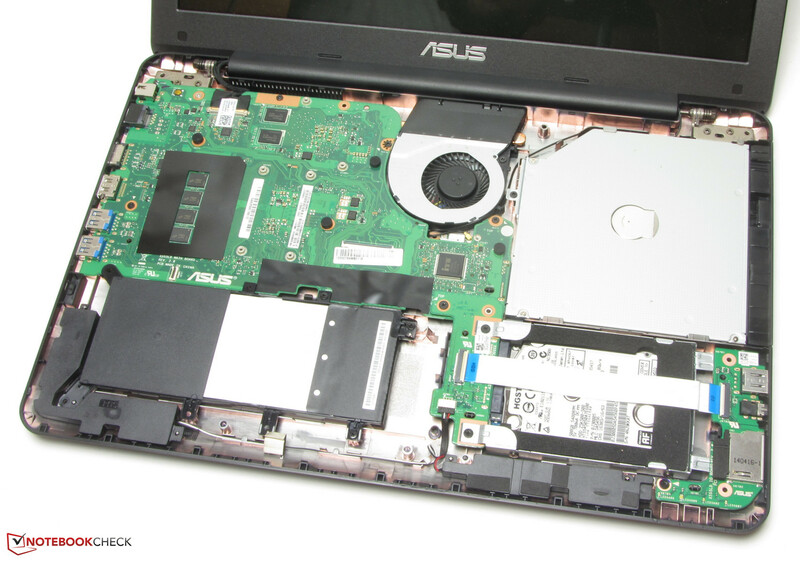 As is usual for Asus laptops, the hard drive is divided into an operating system partition (186 GB) and a data partition. CrystalDiskMark recorded a read speed of 95.24 MB/s. HD Tune delivered an average transfer rate of 77.6 MB/s. These are normal rates for a 5400 rpm hard drive. The access time of 20.2 ms is slightly too high. The X555LD features a graphics switching solution (Optimus) that is comprised of Intel's HD Graphics 4400 graphics core and Nvidia's GPU. The Intel core is enabled for routine tasks and in battery mode. The GeForce GPU is responsible for performance demanding applications like computer games. Switching between the two cores happens automatically, but the user can always intervene manually. The GeForce core belongs to the GPU entry-level division. It supports DirectX 11 and operates with a base speed of 625 MHz. Its speed can be boosted up to 955 MHz via Turbo. The 3DMark benchmark scores are on par with those of other laptops with a GeForce 820M. Asus' laptop is clearly inferior to the IdeaPad Z50-75 and HP's 355 G2 in the 3DMark 2011 benchmark. The 3DMark 2013 benchmarks exhibit the opposite picture. The X555LD can render many games in its native screen resolution using low to sometimes medium quality settings, smoothly. However, these should not be up-to-date games like Assassin's Creed: Unity or Far Cry 4. Only insufficient frame rates are achieved here. The X555LD outperforms rivals like HP's 355 G2 or Lenovo's IdeaPad Z50-75, though. Users who want to play regularly, should opt for another laptop. 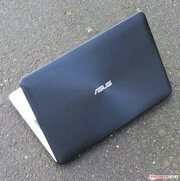 For example, the Asus laptop is also available with a higher-performance configuration. 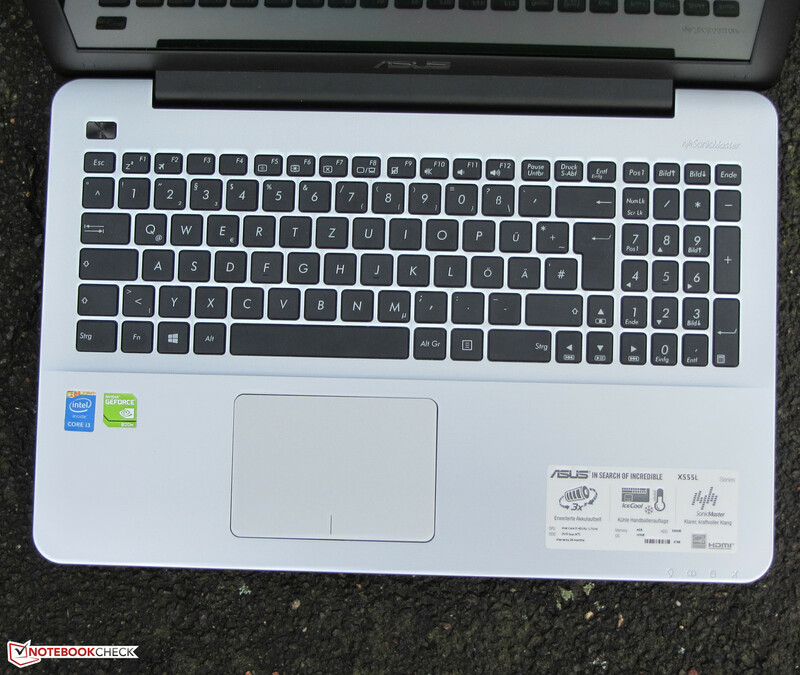 The Asus' X555LN-XO112H model is equipped with a Core i5-4210U processor and a GeForce 840M graphics core. It is currently sold for around 580 Euros (~$651). The fan spins slowly while idling, and thus it only produces a quiet noise. 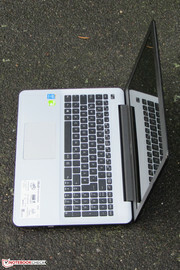 It is the same in HP's 355 G2 and Lenovo's IdeaPad Z50-75. The fan's speed increases as soon as the X555LD is loaded. We measured a noise level of 42.6 dB(A) during the stress test, which is a normal rate for a laptop with this configuration. 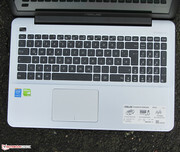 The HP 355 G2 is even louder, and the IdeaPad Z50-75 is considerably quieter because its CPU is greatly reduced. 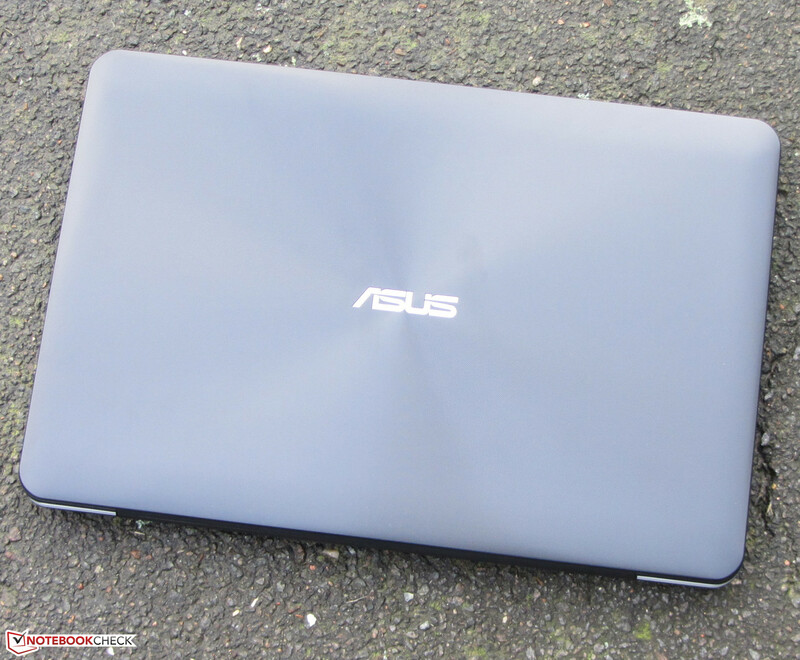 Asus has to be praised for the very low temperature development of the casing, which is also the case in the HP 355 G2 and the Lenovo IdeaPad Z50-75. The temperatures remained clearly below 40 degrees Celsius (~104 °F) on all measuring points, even during the stress test (Prime95 and FurMark run for at least one hour). However, the CPU and GPU did not perform the stress test with reduced speeds, but they ran at full capacity (CPU: 1.7 GHz; GPU: 955 MHz). Only the processor clocked with full speed in battery mode; the graphics core throttled to 162 MHz. (+) The maximum temperature on the upper side is 32.1 °C / 90 F, compared to the average of 36.5 °C / 98 F, ranging from 21.1 to 71 °C for the class Multimedia. (+) In idle usage, the average temperature for the upper side is 23.6 °C / 74 F, compared to the device average of 30.9 °C / 88 F.
The stereo speakers in the X555LD are on the laptop's underside. Overall, they produce decent sound that - like so often - lacks bass. The preloaded Audio Wizard software allows customizing the sound to a certain degree. 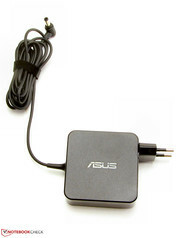 A combo audio jack for connecting headphones or external speakers is available. The X555LD proved to be quite energy-efficient while idling - just like HP's 355 G2. Lenovo's IdeaPad Z50-75 consumes more power. The load power consumption of all three comparison laptops is also very close. The rates range around 40 Watts. Overall, these are normal rates considering the hardware platforms. The battery in the X555LD lasted for 7:48 hours while idling. Lenovo's Z50-75 (5:11 h) is depleted much sooner. Idle mode is ascertained using the Battery Eater Reader's test. The screen is set to minimum brightness, the energy-saving profile is enabled, and the wireless modules are disabled. The X555LD shut down after 1:28 hours of load. Again, the IdeaPad (1:14 h) lags behind. The load runtime is determined by the Battery Eater Classic test, using maximum screen brightness, high-performance profile, and enabled wireless modules. Asus' laptop stopped the practical Wi-Fi test after 4:22 hours, therefore it is positioned between the IdeaPad Z50-75 (2:35 h) and HP's 355 G2 (4:43 h). Websites are opened automatically every 40 seconds using the energy saving profile and a screen brightness of approximately 150 cd/m². We check the video playback time by running the short movie Big Buck Bunny (H.264 encoding, 1920x1080 pixels) in a loop. The wireless modules are disabled, and the screen's brightness is set to approximately 150 cd/m². The X555LD lasted 4:08 hours. Once more, the IdeaPad (2:20 h) lags far behind. 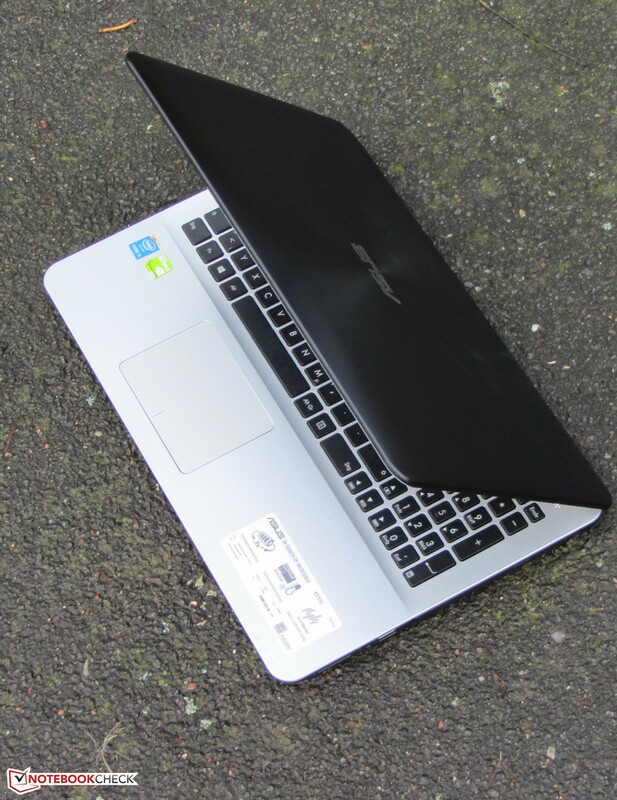 Asus' X555LD-XX283H is a 15.6-inch inexpensive all-rounder. Its computing power is more than enough for everyday use. It is even possible to play computer games - though to a limited extent. Casual gamers should be happy with the gaming power. Furthermore, the laptop barely heats up and can serve with decent battery runtimes. The laptop's keyboard will satisfy home use, but prolific writers will find it rather useless. The installed screen leaves mixed impressions: On the one hand, it delivers a very good color reproduction and decent contrast, and on the other, its brightness is very low. HP's 355 G2 could boast with a somewhat better battery life in our practical battery test. 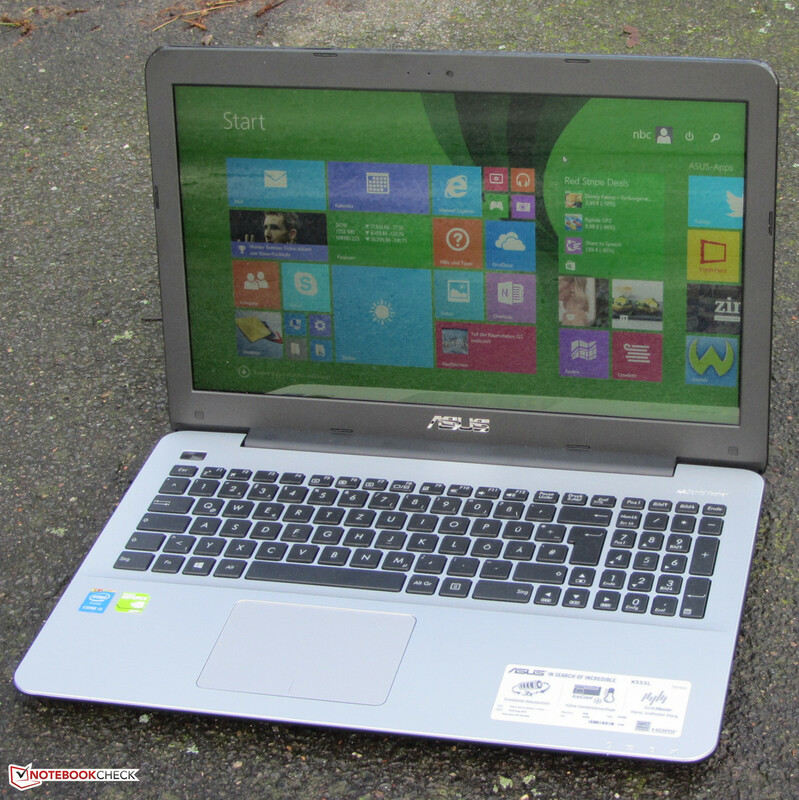 Beyond that, it features a matte screen and two Windows operating systems (Windows 7 Pro, Windows 8.1 Pro). It is also even cheaper than the X555LD. 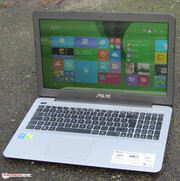 The laptop is available for approximately 380 Euros (~$427). Customers who do not need either of the Windows operating systems, only have to pay up 300 Euros (~$337). Lenovo's IdeaPad Z50-75 is not a real rival for the X555LD or HP's 355 G2. It has a lower computing performance and considerably shorter battery runtimes. The upper tray has to be removed before accessing the hardware. Four gigabytes of working memory are soldered. One empty working memory bank is available. Three screws fix the battery. It can be taken out after removing the screws. The battery and motherboard are plugged. 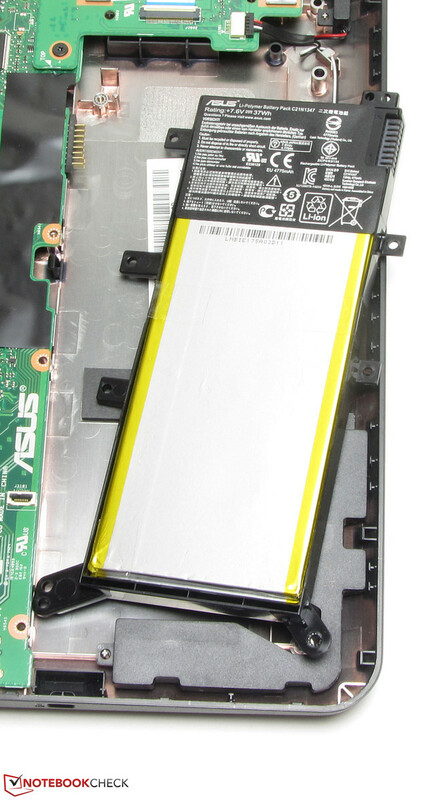 The battery has a capacity of 37 Wh. The power supply has a nominal output of 65 watts. A brighter screen with a matte surface. It is beyond comprehension how Asus can install such a dark screen nowadays.